Hi everyone! 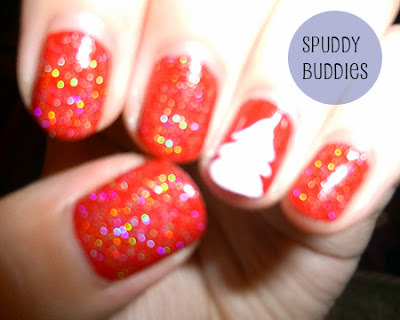 I've got more Christmas nail art for you. I'm really big on the red-and-white theme this year. 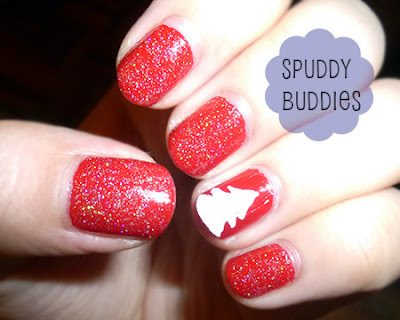 And minimalism is another main theme for my Christmas nails. No idea why but I think it's fun to switch things up. Last year I was all for fun prints and complex designs and multiple colors. You could do this nail design if you don't have much time to spend on drawing details or if you just want a simple accent nail. Easy enough, right? First I used two coats of China Glaze - Salsa for the base. I'm sure you'll agree with me that China Glaze - Salsa is such a pretty red. Every time I reach for a red polish, I end up picking China Glaze - Salsa. I might have to get myself a spare bottle at the rate I'm using it. For the accent nail, I just used my white nail art pen to draw the tree. I didn't spend much time perfecting it which is why it turned out a bit wonky but hey, snow on trees aren't perfectly balanced, are they? Oh I love the fairy dust! Come to Texas and be my personal manicurist please!